SOFTWARE SCRIPTS DIRECTORY WEBSITE + GOOGLE ADSENSE. MAKE MONEY FROM HOME. FINANCIAL SERVICE DIRECTORY WEBSITE + GOOGLE ADSENSE. MAKE MONEY FROM HOME. LEGAL SERVICE DIRECTORY WEBSITE + GOOGLE ADSENSE. MAKE MONEY FROM HOME. DOCTOR SERVICE SEARCH DIRECTORY WEBSITE + GOOGLE ADSENSE. MAKE MONEY FROM HOME. 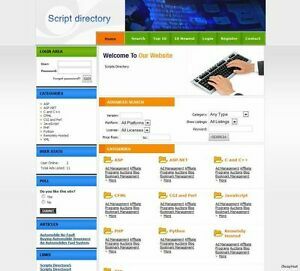 Details about SCRIPTS & SOFTWARE DIRECTORY WEBSITE + GOOGLE ADSENSE. MAKE MONEY FROM HOME. SCRIPTS & SOFTWARE DIRECTORY WEBSITE + GOOGLE ADSENSE. MAKE MONEY FROM HOME. The Scripts Direcotry allows users to browse and search for scripts. Users can also open an account and save their favorite scripts to an online account. Google Adsense Integration. Newest Scripts Displayed on Newest Scripts Page.